Beautiful armoire with hand-made custom 'rope' detailing. 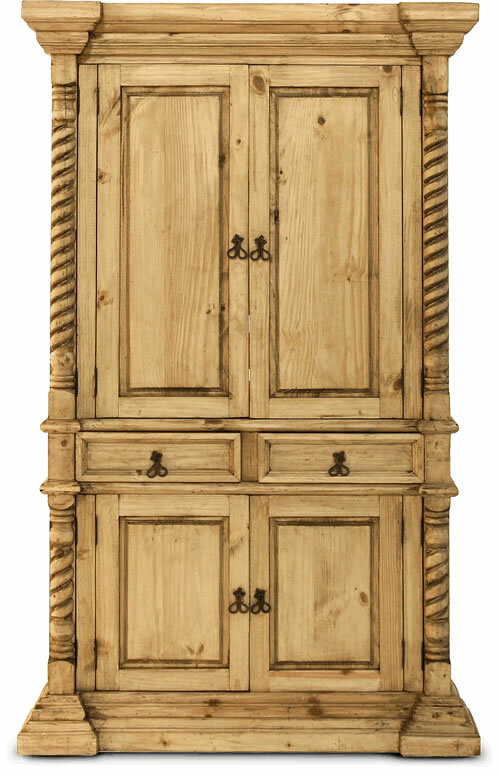 This beautiful rustic armoire will enrich your Mexican Dream Home theme. It features hand-made unusual 'rope' detailing. The one-of-a-kind character of our old wood furniture is enhanced by optional finishes that accentuate the wood grain. Try minor 'weathering' finishes or go for a really old Mexico look by selecting a distressed or 'Designer' finish. We can use reclaimed pine for a truly antique, historical feel. As usual, every item is a unique creation. Expect some minor differences in size, color and trim elements.